Lightweight, polycarbonate buffet and cafeteria serving spoons that won't rust or degrade. These will last for years in your restaurant kitchens and are dishwasher safe. Carlisle Perforated Bowl Spoon Black 10 in. 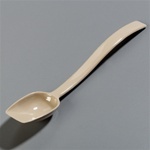 Carlisle Buffet Salad Spoon Beige 0.5 Oz. Carlisle Buffet Salad Spoon Black 0.5 Oz. 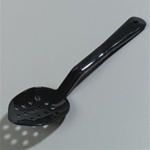 Carlisle Perforated Serving Spoon Black 11 in. 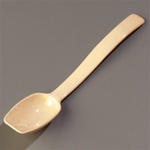 Carlisle Serving Solid Spoon Beige 10 in. Carlisle Serving Solid Spoon Black 10 in. Carlisle Serving Solid Spoon Black 11 in. 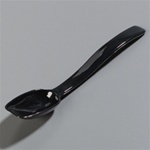 Serving Spoon Black - 8.75 in. 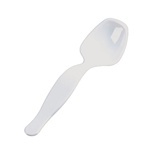 Serving Spoon Clear - 8.75 in. 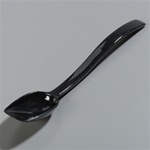 Solid Serving Spoon Black Polycarbonate - 11 in. 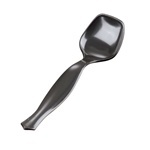 Perf Serving Spoon Black Polycarbonate - 11 in. 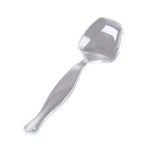 Reflections Serving Spoon Silver - 10 in.